It's springtime here in Michigan, we've been having some wonderful weather! As sunny as it is, it can still be kind of chilly. 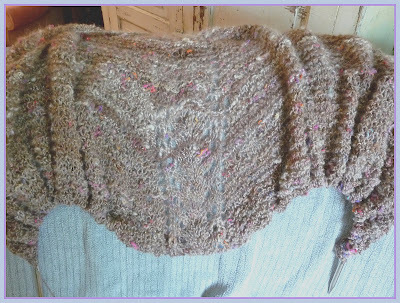 I needed a little something cozy to keep my neck warm for an outing recently, but I wanted something springy looking too. 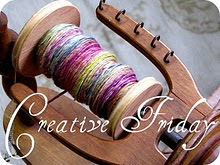 It was a good opportunity to use some of the fun art yarn I've been spinning lately. 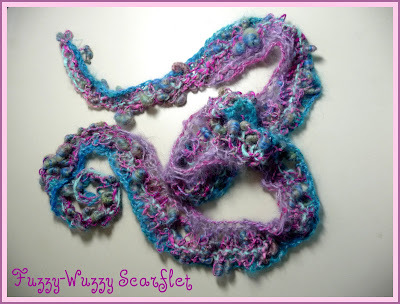 For the body of the scarflet, I used my Fat Fuzzy-Wuzzy Coils, along the edges I used my hand spun angora (DK weight), just to make it extra soft against the skin. 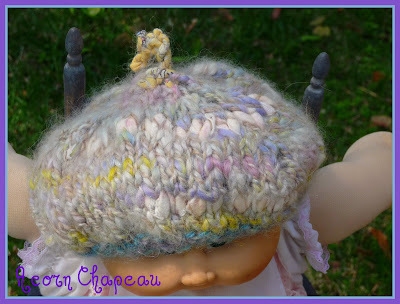 Spring is definitely the time to think about little ones, maybe little sprouts of bulbs and other green things take your fancy (like me) or maybe there is the whisper of other "lil' sprouts" that are soon to be arriving! It's that time of year! I made up this little Acorn Chapeau pattern, knitted from my chunky art yarn called, The Cow Jumped Over The Moon. I also used a little of my worsted hand spun for the ribbing, from the dye batch Vintage Velvet Flowers, a nice complement to the colors in the chunky art yarn. The Acorn Chapeau was kindly modeled by my little friend, borrowed back from the toy box at Grandmas house. 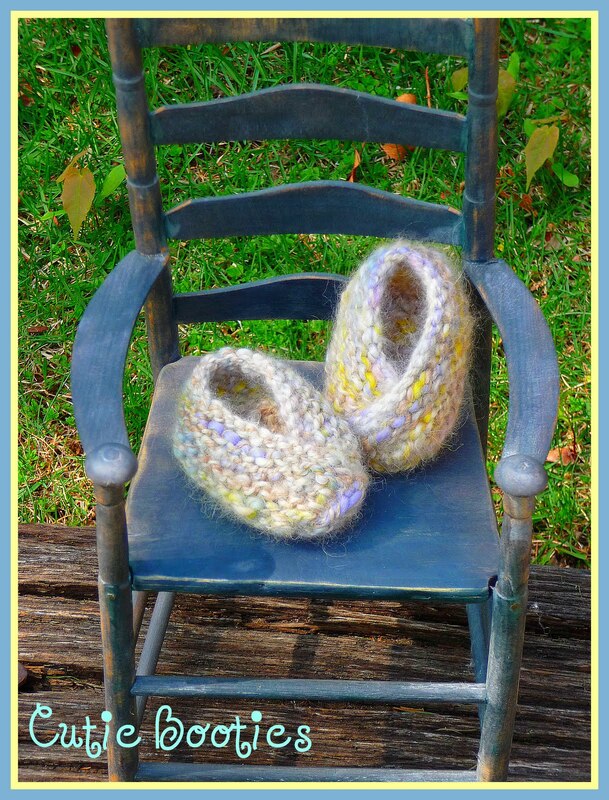 How about these Cutie Booties, knitted following this wonderfully simple pattern known as Chaussons mignons, I also knitted them using chunky, The Cow Jumped Over The Moon. For the booties, however, I edited the thicker areas in the yarn where I had spun in flannel and cotton strips, for such a tiny bootie, it was too much bulk. 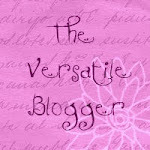 You should check out this pattern, it's ingenious! It could easily be translated into any size slipper you might need. I love the kimono cross over look, it creates a cozy wrap for the foot. The only adjustment that I made was to round the toes a bit, in the pattern, the shape is quite square, nothing wrong with that, I just like the rounded toe better. Well kiddos, I hope you are enjoying the great outdoors! Blessings Friends! A couple of months ago, my friend Pat from my knitting group told me that she had a bunch of fiber that she thought I might be interested in. She was felting an alpaca sweater and had saved the fuzzy fiber that was left behind. All in all it was about a quart sized zipper bag full of purplish pink fuzz. I held onto it, thinking about what I could do with it. The next knit-together, she randomly handed me a fist full of yarn snippets from working in her ends, then on impulse, she handed me the bottle cap from her soda! I guess I'm not fooling people anymore, the word is out, I'm a total magpie! So I tucked the new tidbits in with the felting fuzz and decided to gather whatever future random offerings she gave me, together and then I would make/spin something out of the collection. In the meantime, Pat had a birthday that we celebrated at our Saturday knitting group, I think you can see where this is going! 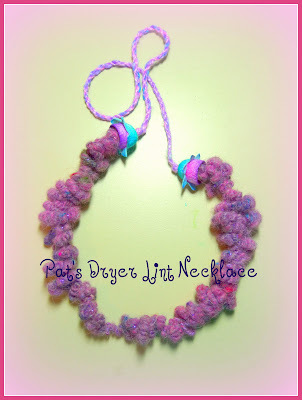 I took the fiber and carded in the yarn snips, then spun it into a chunky coiled yarn and using my hand dyed silk cocoon flowers for findings, plus some hand spun soy silk for the cord, I worked up this fun art yarn necklace. Have a creative weekend! Blessings Friends! So how cute are these little English Daisies? 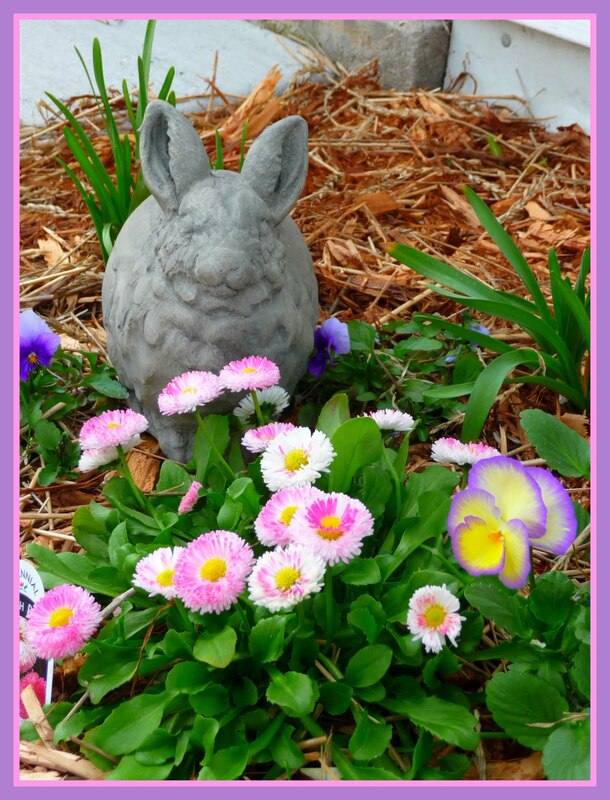 Snowball, my garden bun and I can't get enough of them! When I saw the chunky pink yarn pictured below, it reminded me of these cute little flowers. 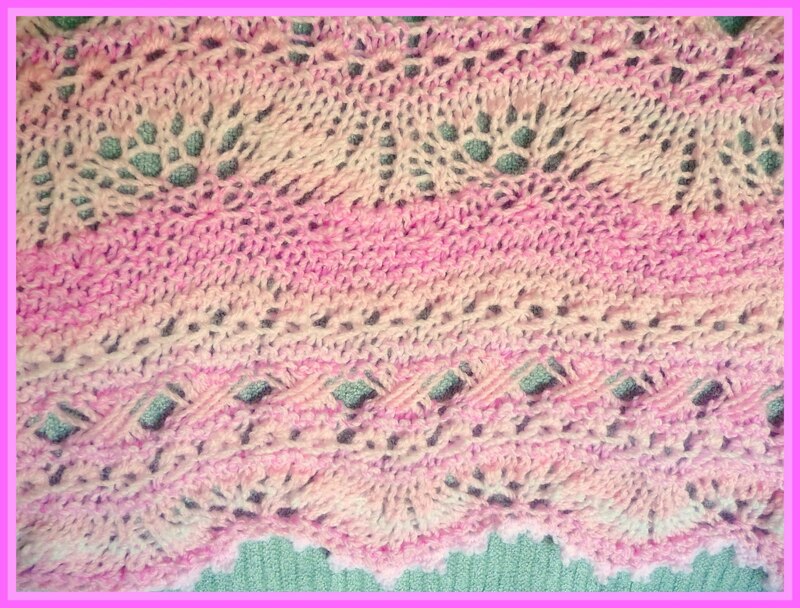 I decided to use the yarn to make an afghan, inspired by those fat little, friendly blooms. 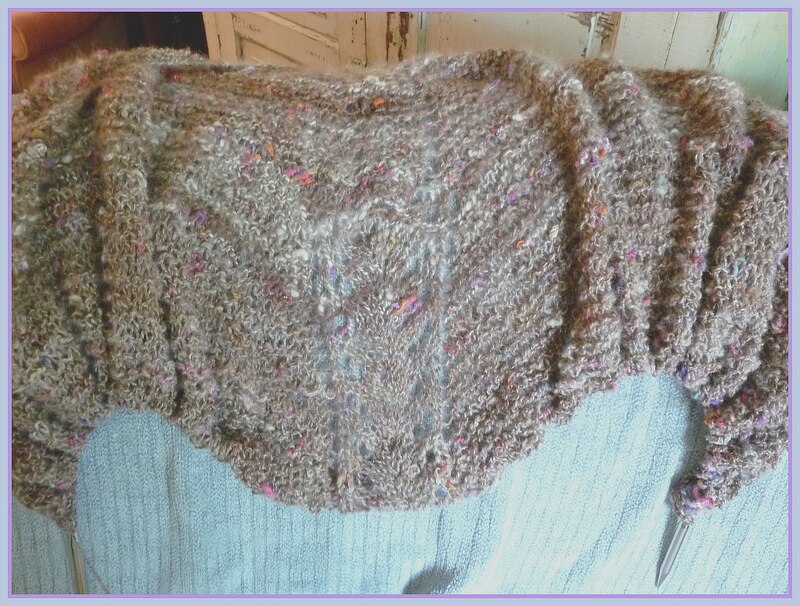 I'm pleased with how it turned out, the yarn is 50% responsible for the success of this little project. I used Marble chunky, it's..gasp...acrylic, I know, I'm a spinner, I love natural fibers, but this yarn is great. 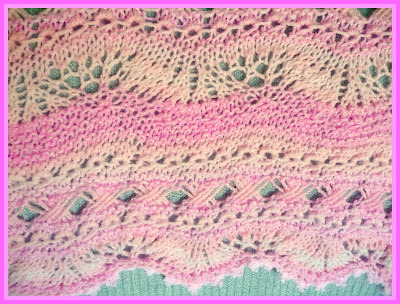 The first time I saw it at the yarn shop, I fell in love, I was so surprised/stunned to find it was 100% acrylic. It's a good choice for an afghan, which will undoubtedly tumble through the wash fairly often. 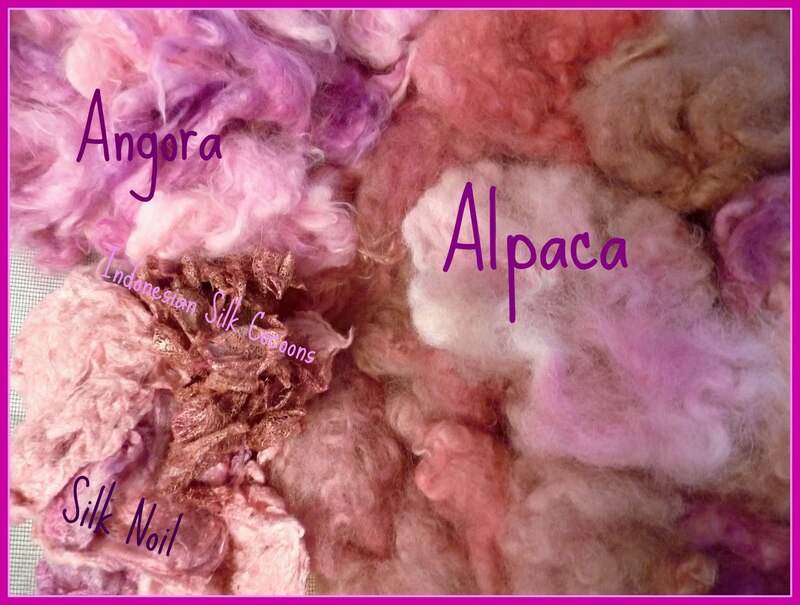 OK, I'm done rationalizing..it's pink, it has a wonderful sheen, it's soft, it's a great yarn. Hope you like my little English Daisy Afghan, it was fun to knit! Enjoy this awesome weather! Blessings Friends!